Okay, okay - this one's a little late to the game. The hustle (and more hustle) of Fashion Month got to me and Paris Fashion Week Spring 2018 ended without my review going up instantaneously. You can't win them all! Although tardy to the party, I promise that this review is bringing more of this season's game-changing coverage. I'm saying "no" to trend reporting and long, detailed critiques and giving you a snapshot of the best moments of the week. Because let's face it, I know you don't have time to read thousands of words. You could be scrolling through this at your desk at work, or taking a study break from the midterms mess. I'm not judging. Off-White presented a collection inspired by the people's princess, Princess Diana herself. In every piece that walked down the runway, the gorgeous icon's signature laidback style was integrated with modern streetwear. Much like everyone else on the internet, I was truly inspired by this show. What's more French than the Eiffel Tower? Saint Laurent took advantage of the stunning scenery by showing their collection directly in front of the iconic landmark. When I close my eyes, I can still see Kaia Gerber stomping down the runway, making a name for herself at Paris Fashion Week. And finally, a non-Fashion Week moment. Balmain announced that they would be partnering with Victoria's SecretVictoria's Secret Fashion Show in a move that makes so much sense I can't believe we haven't thought of it sooner. You can find me posted up in front of the TV, waiting for the to air. Joseph Altuzarra did not disappoint in his first show since leaving New York. Each look that came down the runway had a unique flair and didn't mimic any of the "trends" that we've seen this season. There were so much individuality and voice throughout the collection that I'm officially calling this one of my favorite shows of the season. P.S. I want those mid-height gladiator boots. Rodarte was another show that stood out from the crowd for me. Known for almost having a "theme" to each collection (one year, Star Wars was the defining characteristic), this year's was clearly dark romanticism. Sheer paneling, ruffles, and shaggy fur coats were the three must-try aspects of this showing. Pierpaolo Piccioli is still crushing it. Valentino continues to be one of my favorite shows, season after season, for its elevated take on eveningwear. However, the gowns weren't the only standouts to me in this collection. Shiny outerwear had a glamorous but utilitarian feel, while fanny packs made a case to become the next big accessory. 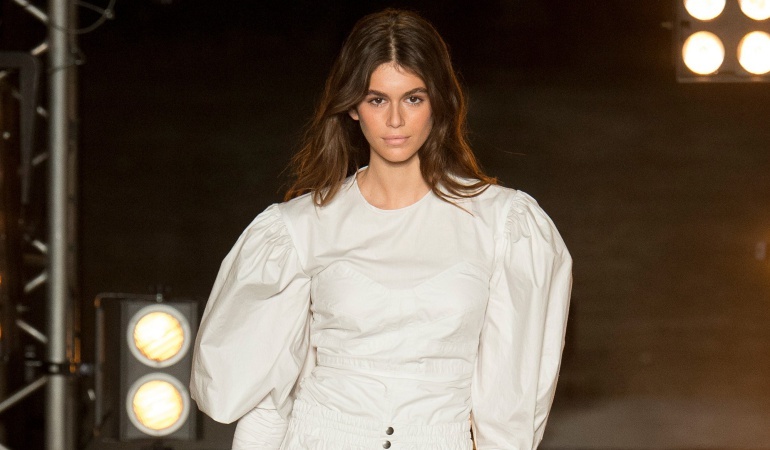 You know I love a naked face with a bold brow, and that's just what Isabel Marant gave us. A wash of bronzer, thickened brows and highlighted inner corners made for the perfect "I just got back from vacation" face. This look never goes out of style. Consider this one similar to the Isabel Marant look above, but with more highlight. Undereyes were brightened with a light shade of concealer, while the cheekbones, nose, and even the forehead were given the reflective treatment. Are you starting to sense a theme? Proenza Schouler jumped on the naked face train and took it one step further. Brows were fully filled in, the face was highlighted and bronzed and, the finishing touch, hair was slicked back to show it all off.